In case you are wondering, or if you find this fact hard to believe, here is a list of Aggie teams that accomplished elements of this trifecta but were unable to complete it due to a number of different reasons (reasons such as no post-season rankings during that time, no bowl games, etc.). I felt it was only fair that the accomplishments of these teams get pointed out here, with a notation on how they differed from the 1976 team’s accomplishment. (10) the 1994 team defeated the Longhorns in Austin, finished the season ranked in the top-10, but were ineligible to play in a bowl game and were thus not invited. 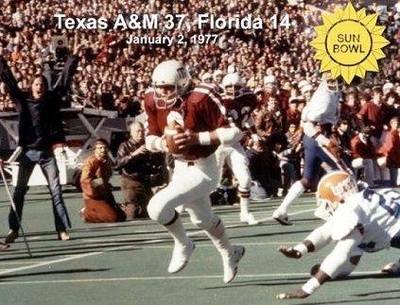 This entry was posted in 1976, Aggie History, Championships and Season Results, History, Texas A&M, Texas Longhorns by Travis Normand. Bookmark the permalink.